Robert Koch was a German physician who is widely credited as one of the founders of bacteriology and microbiology. He investigated the anthrax disease cycle in 1876, and studied the bacteria that causes tuberculosis in 1882, and cholera in 1883. He also formulated Koch’s postulates. Koch won the 1905 Nobel Prize in Physiology or Medicine. Born on 11 December in 1843 in Glausthal, Germany, Robert Koch was a childhood prodigy. He taught himself to read newspapers when he was only 5. He loved to read classical literature and was a chess expert. He gained an interest in science while in high school, and decided to study biology. Koch acquired his medical degree from the University of Göttingen, Germany in 1866. Koch developed a strong interest in pathology and infectious diseases as a medical student. After working as a physician in many small towns throughout Germany, he volunteered as a military surgeon during the Franco-Prussian war (1870-72). He was appointed a district medical officer for Wollstein after the war. His main duty as a medical officer was investigating the spread of infectious bacterial diseases. Koch was very much interested in the transmission of anthrax from cattle to humans. Not very happy with the prevailing process of confirming the cause of infectious disease, Koch formulated four criteria in 1890 that must be achieved for establishing a cause of an infectious disease. These rules were termed as “Koch’s postulates” or “Henle-Koch postulates”. German pathologist Friedrich Gustav Jakob Henle was a collaborator in Koch’s research. 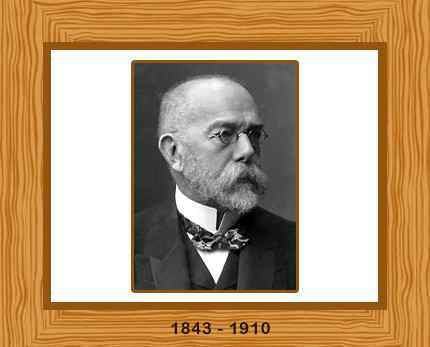 Robert Koch’s brilliant contributions were acknowledged in 1905, and he won the Nobel Prize for Physiology or Medicine. The medical applications of biotechnology still heavily depend on the Koch’s principles of affirming the causes of infectious diseases. Koch died on 27 May in 1910 in Black Forest region of Germany. He was 66 years old.